I wonder if any smart programmers have been able to break into the S1000R's computer to modify certain values. In my case, I'd be willing to pay for a new Road mode. My preference would be a combination of Rain mode DTC values + Dynamic mode throttle response. This would still retain the original Rain mode for really crap conditions, but would enable me to enjoy a brisk response while the nannies are still watching out for me (ex., on an everyday ride). For focused weekend rides in ideal conditions, I'd go for the original Dynamic mode. Good question. I wish I could have Road mode suspension with Dynamic mode throttle response. I would be really surprised to see if someone could hack the existing ECU to make that functionality. Altering data tables is one thing, but this is a whole different matter. What you are looking for sounds like the new User Mode on the the RR. Given that other manufacturers are also offering user configurable modes, I'm sure it's just a matter of time before the R gets one as well. In true BMW fashion, I'm sure it will be an optional feature for $$, too. I thought road-dyn pro all had the same throttle and power curves? Someone put up a table that showed the relationship between abs/tc/power/suspension recently. This...if true...is rediculous. They better have included the ability to change damping characteristics in some way other than one or two helmets. I heard that they combined soft/normal into road and dynamic stayed the same. My understanding is that the bike is able to identify if the road is bumpy or not and whether if it should use soft settings or normal settings on the fly. I am a bit disappointed that there is no user mode that lets us set each setting and store it as a separate mode. A customized user mode would be a lot better then Dynamic Pro. This...if true...is ridiculous. They better have included the ability to change damping characteristics in some way other than one or two helmets. If Road/Dynamic are the 2 options it looks like they have gone down the route of the XR, although the XR has Dynamic ESA and not DDC. 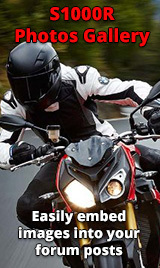 Yup, new rider's manual confirms it.